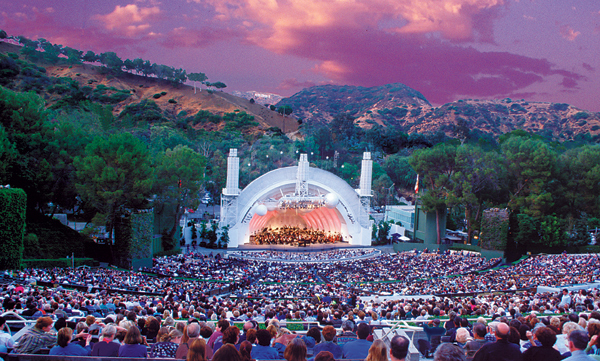 With 18,000 seats, the Hollywood Bowl is the largest natural amphitheater in the United States. Opened in 1922, the Bowl hosts hundreds of people who picnic in their seats and around the grounds before shows. In the summer, it is home to the Los Angeles Philharmonic (the Phil plays in the Walt Disney Concert Hall the rest of the year) and a slate of touring music acts. There's a lineup of jazz and classical music, as well as more youthful concerts. Two concert collaborations with the Los Angeles Philharmonic have been planned at the Hollywood Bowl for the 2015 IHS: Tuesday, August 4, 2015 and Thursday, August 6, 2015. A new horn ensemble commision, Schumann's Konzertstück, and “horn-heavy” symphonic works will be performed. The Hollywood Bowl is accessible by the METRO.